Petit Verdot is an interesting grape. It is historically one of the red varieties of Bordeaux. It is added to the Cabernet Sauvignon dominant blends of the Left Bank in order to enhance their color, depth and exotic perfume. Like Cabernet Sauvignon it is rot resistant, thick-skinned, and tannic. It is the inkiest of the Bordeaux reds, and in warm years it produces full-bodied, age-worthy wines with a hint of spice that make an invaluable endowment to the stars of the Médoc. 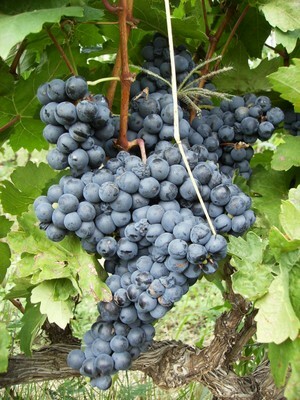 Petit Verdot, however, is the last of the Bordeaux grapes to ripen. Its need a for warm, long harvest season explains why it is used so little in France yet thrives and is increasingly popular as a varietal wine in New World regions such as Australia, Chile and California. Australia leads the pack with nearly twice the acreage planted as Bordeaux, roughly three times that of California and sixteen times that of Chile. It should be noted that the ‘Verdot’ of Argentina’s Mendoza region (in which there is very little planted) is believed to actually be Gros Verdot, an unrelated grape with far less character. Petit Verdot is currently produced in over 70 California wineries including Baehner Fournier Vineyards in Solvang, Cactus Star in Ramona and Massa Estate in Carmel Valley.